We set out to improve our collection process and proceed with a more aggressive approach. The new process consists of three stages, it is largely automated, used across all markets where we operate and is continued until the full overdue amount is covered or the claim is written-off. Our aim is to prevent customers from defaulting on their debt obligations. We work towards reducing roll-rate between stages and increasing recovery rate in Spain and Finland. We start this stage with sending out in-house emails and text messages with payment details and use automated phone calls to find a solution. If the above has not been successful, we hand over the claim to a local debt collection agency (DCA) who takes over the communication with the goal to collect the debt and agree on a new payment schedule with the debtor. During this time we also forward the debtor’s information to the official debt registry. The overdue loan stays with the first DCA until the loan defaults. If the first DCA was not successful on agreeing on a new schedule and receiving at least one payment from the debtor, the claim is handed over to a second DCA. The second DCA will have 90 days to activate the debtor before we pass the case to the next stage. In case the DCAs have not been successful without using legal litigation then a court case will be filed with a local court unless for some reason the case has to be written off (read below). Court process length is dependent on the country and the local court. The case is handed over to a local bailiff after a court makes a decision. The speed of recovery will thereafter depend on the income/assets of the debtor and their other debts. During the stages the debtor has the possibility to file for debt restructuring where the court creates a payments plan for the debtor and the debtor is required to pay according to the new schedule. Under the stage 3 we mark all the claims that are unlikely to be paid back. In most cases this stage consist of cases where the debtor has filed for bankruptcy, has deceased or the debtor or related claim is under criminal investigation. This stage also covers cases where the borrower has repaid the entire amount required under a settlement but it’s not enough to cover the full claim amount that we have calculated. This difference is caused by reduction of the claim or costs associated with recovery that are not reflected in the system. 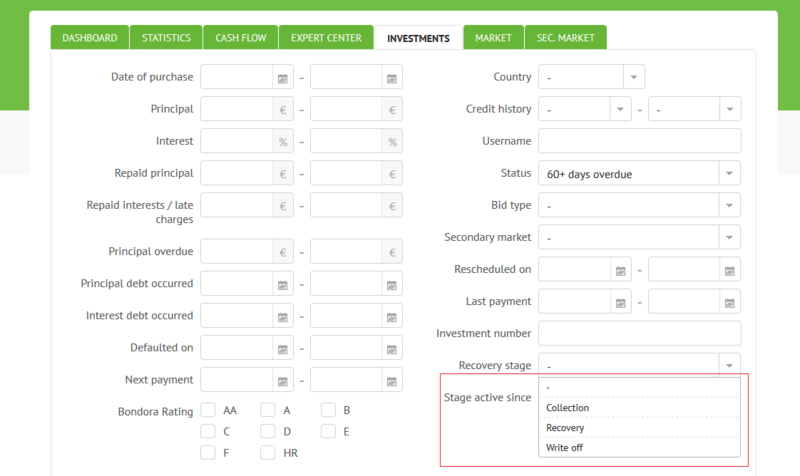 We are continuing to improve our system to make all recovery information available to investors. Bankruptcy process is only initiated if bailiff has not been able to collect the debt after freezing the debtor’s assets and accounts or if the debtor itself has filed for bankruptcy. In general personal bankruptcy is not common in continental Europe as getting out of debt will take up to 7 years depending on the country. So far our collection & recovery process has proven itself, even though kicking it off properly has taken some time. After we started using the DCA services in June 2015 our investors have received over 1 million euro. Combining our new, more aggressive collection and legal litigation with the previous process will further improve our recovery performance across all markets. Are you serious in sharing that excel file? So you say there you have an process improvement of 21% for estonian loans. Bellow you have “Default in 360D if loan 7D past due”of 58%. Both these values are inputs in the respective cells, but what surprises me is that the “Default in 360D if loan 7D past due w collection” is defined by 58% and the “Process improvement”. I thought the improvement was calculated based on a comparison, and not used as input to get the numbers you want. The way I see it, the numbers look very artificial and manufactured. In short, how do you get to the 48% for estonian “Default in 360D if loan 7D past due w collection”??? The model shows results based on two logic: 1) cost of early collection is applied only to the loans that were ‘saved’ and 2) cost of early collection was applied to everything. I hope this makes it more clear why it makes sense to collect early. The break-even point is relatively low as the cost of collection is applied to a single monthly payment but cost of default is driven by the entire loan balance. I understand your frustration. Our debt servicing team’s priority is to improve the collection efforts to return as much capital to the investors as possible through strong processes. After standard processes have been established then necessary reporting interfaces are built. Doing it in the different order could certainly improve transparency and reporting but not the actual performance. We are continuously looking to improve this area. You know that after slovakia and spain, investors have been very skeptical with bondora. My suggestion is that BIG changes like this one should be announced beforehand and justified with a proper analysis. I still remember reading here that investing in loans from slovakia would reduce risk of my portfolio. I am sure your team is full of good intentions, but I still know very little about how you got the data to make this major change. Please don’t take this post as someone being annoying and distrustful, but instead listen to investors. We don’t ask for much, just that you justify your choices with a good analysis, and that you let us know beforehand, not a few weeks after changes are put in place.